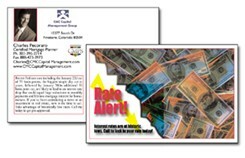 Alert your clients and prospects to changes taking place in the marketplace with this Rate Alert card. Your photo, logo, contact information on the back along with a short narrative explaining what's going on and why they should contact you for more information. 4.25"" x 5.5"", Full color both sides. Printed on 100lb gloss cover stock.